ALEXANDER McQUEEN READY-TO-WEAR FALL-WINTER 2009. Paris Fashion Week. RUNWAY MAGAZINE ® Collections Special Selection “Fashion Treasure”. One of the greatest designers who reformed and influenced fashion, who let his “Angels and Demons” out. The innovations of this collection were set as trend, multiplied and repeated later by many designers. This collection created in 2009 became an iconic reference for the next 10 years. Designers from all over the world continue to repeat and replicated different looks, elements, silhouettes, of this collection. Alexander McQueen maybe not the first one who used soda canes to create headpieces, but he is certainly the first one who actually created the headpieces like the art objects assembled with colored duct tape. The make up for this collection is also very spectacular, and was repeated since than by many designers from USA and England. This collection is a tribute to CHANEL. 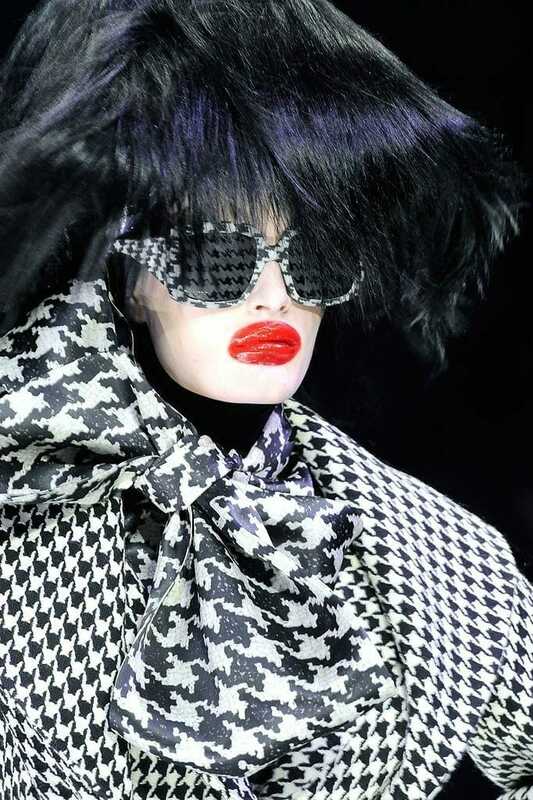 Alexander McQueen decided to “show his love” and created several pieces in the “mood”, “in the style” of CHANEL. We would like to make a POINT here and describe the difference between INSPIRATION and COPY. It is important to see and know the difference in the “era of copy” or “era of replicas”. Many designers for the last 20 years not just replicate the style or silhouette, but replicate pieces of the great designers and present as their own. When the fashion critics point that this is copy, designer who presented the copy has one answer: “this is not a copy, I was just inspired”. That is probably why fashion critics are no longer welcome to the fashion shows. Their place took fashion bloggers, who has no knowledge or culture, they are here to create “buzz” and show themselves during the event without attention to what actually designer shows. It is like another version of vulgar carving on the trees “Patricia was here”. “Inspiration” is a creation “in the style”, a creative process “in the certain frame”, like several pieces of Alexander McQueen in this collection is a creative work in “CHANEL style”. “Copy” or “Replica” is exact copy, which duplicates an original artistic work, in smaller scale, with diminutive quality for example. Many legal issues raised for the past 10 years about this issue. There are already known the legal issues initiated by the designers who create the original work against the designers who made a copy, and in addition to the fact of copy destroying reputation of the copied original and designer because of the diminutive quality of the copy. Back to this collection created for the Fall-Winter 2009 season by Alexander McQueen, we can only add that this collection is one of the most known iconic collections of this great designer, which became ultimate reference of this designer.